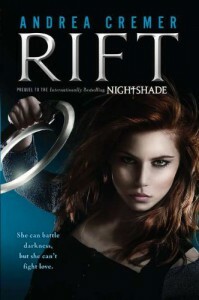 4.5 stars.It didn’t feel like much happened in Rift until the big event towards the end and that this book was just a precursor to what was to come in Rise. However, having said that, I liked Rift very, very much. I don’t think something has evoked that much resentment in me to a few characters in some time. I found the beginning a bit slow as I was getting into the time period and the third person as I was so used to Cremer’s first person narrative in the Nightshade books, but once I learnt more about the Guard and Conatus I just could not get enough. Ember was a wonderful heroine to follow and I kind of do love her more than Calla now. The supporting cast as always were fantastically well-drawn too.I read Rise immediately after, and loved how this prequel duology played out.